Cortisone (corticosteroids) or steroids have been in use for the treatment of various diseases, administered either locally (on skin) or oral tablets or through injections. Judicial use of cortisone is life saving, however, its routine use may not be indicated as often as it has been prescribed. a Skin diseases: Psoriasis, Eczema, Vitiligo, Urticaria, Lichen planus, etc. b Autoimmune diseases: Polymyositis, Rheumatoid arthritis, etc. Atherosclerosis i.e. "hardening of the arteries"
Moon face is a common side effect of cortisone: Typical swollen face with excessive hair growth on forehead due to cortisone use. 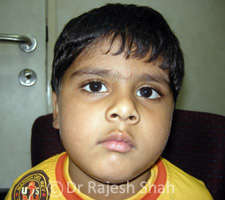 The second photo shows normal face on stopping cortisone, while on homeopathic treatment. 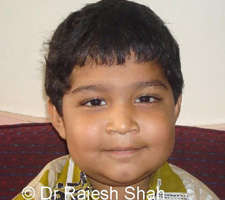 A 4 years old child suffering from Nephrotic Syndrome who developed "moon face" i.e. swelling on the face, due to cortisone. 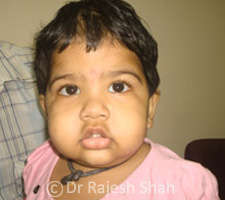 1 year 4 months old child suffering from Nephrotic Syndrome who developed "moon face", due to cortisone. Dependency: One of the most important problems with the use of cortisone is that it produces drug dependency. Once cortisone used, it is likely that you may have to use it again, as the disease is likely to relapse on stopping it. Rebound effect: Another hurdle with the use of cortisone in any form is the rebound effect after stopping its use. In most of the diseases such as psoriasis (local and oral cortisone), vitiligo (local and oral cortisone), urticaria (oral cortisone), ulcerative colitis (oral cortisone), nephrotic syndrome (local cortisone), lichen planus (local, injectible and oral cortisone), etc. it has been observed that patients receiving cortisone respond well initially. However, either on stopping it or on long term use, there is either a severe relapse or flare up in the form of a rebound effect. Such a flare up is often difficult to handle with mild medicines; as it might require probably higher dose of cortisone. This leads to a vicious cycle. Suppresses immunity: Cortisone is an immunosuppressive medicine. It suppresses and alters the immunity, making one prone to have relapse of the same disease with more intensity. Changes in appetite: An increase in appetite and weight gain is seen in many long-term receivers of corticosteroid therapy. Generalized swelling in the body: Corticosteroids can cause excess water retention within the body, thus making it swell. Salt and water retention can also lead to high blood pressures and reduced levels of potassium in the blood. 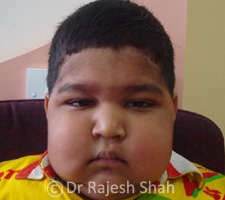 Faulty fat deposition: There ma be excess fat deposition in the back, face, chest and abdomen. Skin changes: The skin becomes very delicate and bruises easily. It may appear very thin in certain areas with patchy discoloration. Wound healing may also take a longer time than usual. Acne and dry skin are other skin conditions commonly seen. Repeated infections: Corticosteroids can depress your immune system, thus lowering our body's natural defenses against illnesses. Hence, repeated infections are very common in long-term Corticosteroid therapy. Sleep problems: Difficulty in falling asleep (insomnia) is a common side effect. Mood changes: Person can either become very irritable, very euphoric or depressed for no understandable reason. Eye disorders: Cataract, glaucoma and exophthalmos are known to occur in long-term Corticosteroid treatment. Gastrointestinal upsets: Stomach ulcers and inflammation of the pancreas (pancreatitis) are common conditions arising from long-term treatment. Adrenal suppression: Long-term treatment with Corticosteroids can suppress the natural production of these hormones from the adrenal glands. This particularly occurs when these medications are suddenly stopped or not tapered off properly. Diabetes: Long-term use of Corticosteroids can result in increased blood sugar levels. Critical adverse effects: Adverse reactions to cortisone can call for emergency care. Seek immediate medical advice if you experience any of the following when on cortisone therapy. Sudden onset of visual disturbances. Severe headache, giddiness, imbalance, weakness and rapid heart beat, with or without excessive sweating. Any sudden skin eruptions like hives or urticaria. Sudden swelling of the face, lips or hands and feet. a Is this cortisone therapy really essential at this time? b Is it going to cure my disease? c How long will I have to take it? d What will happen when I will stop it? e What are the likely adverse effects? f On discontinuing the use of cortisone, will my disease relapse? If yes, will I require to use cortisone once again or I will be able to manage with milder medicine at that time?